This article appeared in Fermilab Today on Nov. 18, 2014. In late October, the American Physical Society Division of Particles and Fields announced that Stanford University professor emeritus of physics and Fermilab collaborator Stanley Wojcicki has been selected as the 2015 recipient of the W.K.H. Panofsky Prize in experimental particle physics. Panofsky, who died in 2007, was SLAC National Accelerator Laboratory’s first director, holding that position from 1961 to 1984. Wojcicki is a founding member of MINOS. He served as spokesperson from 1999 to 2004 and as co-spokesperson from 2004 to 2010. Wojcicki recalls the leadership of Caltech physicist Doug Michael, former MINOS co-spokesperson, who died in 2005. “I always regret that Doug did not have a chance to see the results of an experiment that he very much contributed to,” Wojcicki said. 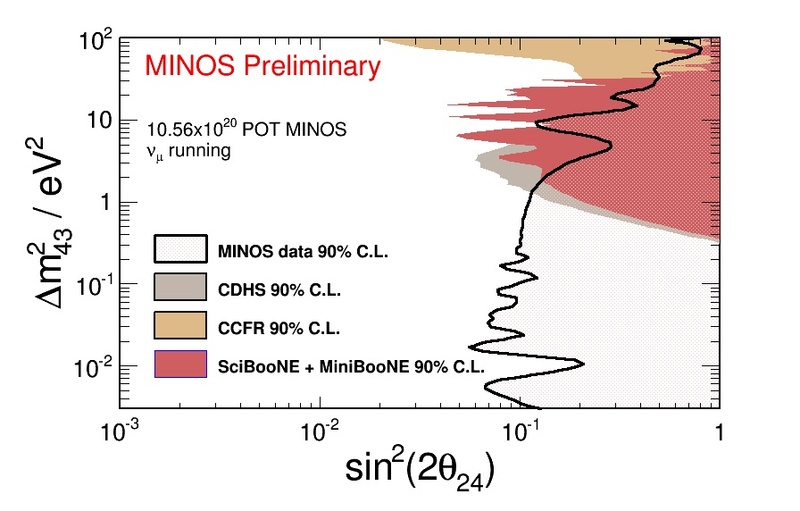 In 2006, MINOS measured an important parameter related to the mass difference between two neutrino types. Fermilab physicist Doug Glenzinski chaired the Panofsky Prize review committee and says that the committee was impressed by Wojcicki’s work on flavor physics, which focuses on how particles change from one type to another, and his numerous contributions over decades of research. “He is largely credited with making MINOS happen, with thinking about ways to advance neutrino measurements and with playing an active role in all aspects of the experiment from start to finish,” Glenzinski said. More than 30 years ago, Wojcicki collaborated on charm quark research at Fermilab, later joining Fermilab’s neutrino explorations. Early on Wojcicki served on the Fermilab Users Executive Committee from 1969-71 and on the Program Advisory Committee from 1972-74. He has since been on many important committees, including serving as chair of the High-Energy Physics Advisory Panel for six years and as member of the P5 committee from 2005-08. He now continues his involvement in neutrino physics, participating in the NOvA and MINOS+ experiments. This article appeared in symmetry on June 4, 2014. If you’re searching for something that may not exist, and can pass right through matter if it does, then knowing where to look is essential. That’s why the search for so-called sterile neutrinos is a process of elimination. Experiments like Fermilab’s MiniBooNE and the Liquid Scintillator Neutrino Detector (LSND) at Los Alamos National Laboratory have published results consistent with the existence of these theoretical particles. But a new result from the long-running MINOS experiment announced this week severely limits the area in which they could be found and casts more doubt on whether they exist at all. Scientists have observed three types or “flavors” of neutrinos—muon, electron and tau neutrinos—through their interactions with matter. If there are other types, as some scientists have theorized, they do not interact with matter, and the search for them has become one of the hottest and most contentious topics in neutrino physics. MINOS, located at Fermilab with a far detector in northern Minnesota, has been studying neutrinos since 2005, with an eye toward collecting data on neutrino oscillation over long distances. MINOS uses a beam of muon neutrinos generated at Fermilab. As that beam travels 500 miles through the earth to Minnesota, those muon neutrinos can change into other flavors. MINOS looks at two types of neutrino interactions: neutral current and charged current. Since MINOS can see the neutral current interactions of all three known flavors of neutrino, scientists can tell if fewer of those interactions occur than they should, which would be evidence that the muon neutrinos have changed into a particle that does not interact. In addition, through charged current interactions, MINOS looks specifically at muon neutrino disappearance, which allows for a much more precise measurement of neutrino energies, according to João Coelho of Tufts University. “Disappearance with an energy profile not described by the standard three-neutrino model would be evidence for the existence of an additional sterile neutrino,” Coelho says. The vertical axis shows the possible mass regions for the sterile neutrinos. The horizontal axis shows how likely it is that a muon neutrino will turn into a sterile neutrino as it travels. The new MINOS result excludes everything to the right of the black line. The colored areas show limits by previous experiments. This graph shows the combined MINOS/Bugey result (the red line) in comparison with the results from LSND and MiniBooNE (the green areas). The vertical axis shows the possible mass regions for sterile neutrinos. The new MINOS/Bugey result excludes everything to the right of the red line. This column by Fermilab Director Pier Oddone first appeared in Fermilab Today Jan. 3 . We have a mountain of exciting work coming our way! In accelerator operations, we need to give enough neutrinos to MINERvA to complete their low-energy run, enough anti-neutrinos to MiniBooNE to complete their run and enough neutrinos to MINOS to enable their independent neutrino velocity measurement that will follow up on last year’s OPERA results. We need to provide test beams to several technology development projects and overcome setbacks due to an aging infrastructure to deliver beam to the SeaQuest nuclear physics experiment. And we need to do all of this in the first few months of the year before a year-long shutdown starts. During the shutdown, we will modify the accelerator complex for the NOvA era and begin the campaign to double the number of protons from the Booster to deliver simultaneous beams to various experiments. In parallel with accelerator modifications, we will push forward on many new experiments. The NOvA detector is in full construction mode, and we face challenges in the very large number of detector elements and large mechanical systems. Any project of this scale requires a huge effort to achieve the full promise of its design. We have the resources in our FY2012 budget to make a lot of progress toward MicroBooNE, Mu2e and LBNE. We will continue to work with DOE to advance Muon g-2. All these experiments are at an important stage in their development and need to be firmly established this year. At the Cosmic Frontier, we will commission and start operation of the Dark Energy Survey at the Blanco Telescope in Chile, where the camera has arrived and is being tested. In the dark matter arena we will commission and operate the 60 kg COUPP detector at Canada’s SNOLAB and continue the run of the CDMS 15 kg detector in the Soudan Mine while carrying out R&D on future projects. We continue to have a major role in the operation of the Pierre Auger cosmic-ray observatory. In addition we should complete the first phase of the Fermilab Holometer, which will study the properties of space-time at the Planck scale. At the Energy Frontier, we play a major role in the LHC detector operations and analysis. It should be a fabulously exciting year at the LHC as we push on the hints that we already see in the data. Beyond construction and operation of facilities we continue our R&D efforts on the superconducting RF technology necessary for Project X and other future accelerators. We will be building the Illinois Accelerator Research Center and moving forward to connect our advanced accelerator program with industry and universities. Our rich program on theory, computation and detector technology will continue to support our laboratory and the particle physics community. If we accomplish all that is ahead of us for 2012, it will be a year to remember and celebrate when we hit New Year’s Day 2013! Christmas time brings not only presents and pretty cookies but an outpouring of media lists proffering the best science stories of the year and predicting those that will top the list in 2012. While the lists varied wildly everyone seemed excited by a few of the same things: upsetting Einstein’s theory of special relativity, a hint of the ‘god particle’ and finding planets like our own. Several of the stories that made nearly every media outlet’s list, though in various rankings, have a connection, directly or indirectly, to Fermilab. Here’s a sampling with the rankings from the publications. Discover magazine had the largest list, picking the top 100 science stories. 1: A claim by researchers at the OPERA experiment at CERN that they had measured neutrinos traveling faster than the speed of light, something disallowed by Einstein’s Theory of Special Relativity. Now the scientific community is looking for another experiment to cross-check OPERA’s claim. That brought renewed interest to a 2007 measurement by the MINOS experiment based at Fermilab that found neutrinos skirting the cosmic speed limit, but only slightly. The MINOS collaboration always planned to study this further when it upgrades its detector in early 2012 but the OPERA result added new urgency. 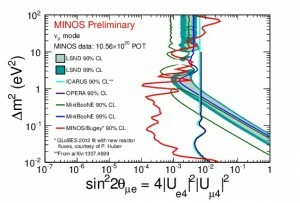 Look in 2012 for MINOS to update the time of flight of neutrinos debate in three stages. First, MINOS is analyzing the data collected since its 2007 result to look for this phenomena. Results should be ready in early 2012. This likely will improve the MINOS precision in this area by a factor of three from its 2007 result. Second, MINOS is in the process of upgrading its timing system within the next few months using a system of atomic clocks to detect when the neutrinos arrive at the detector. The atomic clock system will progressively improve resolution, which is needed to make the MINOS analysis comparable to the OPERA result and improve precision from the 2007 MINOS result by as much as a factor of 10. That will tell us if OPERA was on the right track or not, but may not be the definitive answer. That answer will come with the upgrades to the MINOS experiment and a more powerful neutrino beam, producing a larger quantity of neutrino events to study. The upgraded MINOS experiment will be in many ways a more precise system than OPERA’s and could produce a result comparable with OPERA’s precision likely by January 2014. 4: Kepler’s search for Earth-like planets that could sustain life produces a bounty of cosmic surprises, fueled, in part, by the computing skills of a Fermilab astrophysicist. 32: The on-again, off-again rumor of finding the Higgs boson particle. 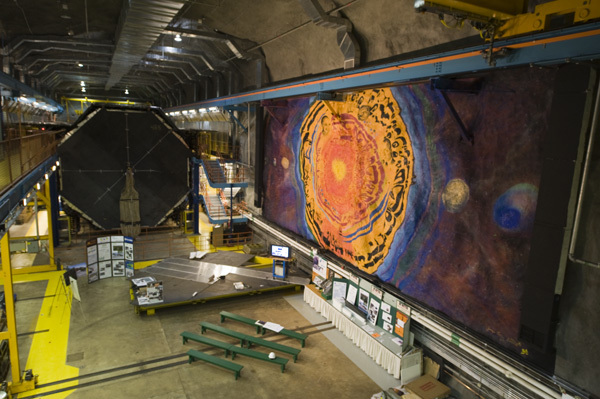 Physicists working with experiments at Fermilab’s Tevatron experiments and CERN’s Large Hadron Collider expect to answer the question of whether a Standard Model version of the Higgs exists in 2012. 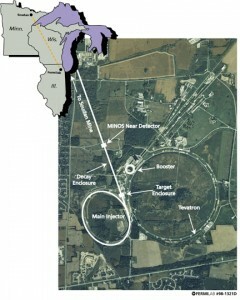 65: The shutdown of the Tevatron at Fermilab after 28 years and numerous scientific and technological achievements. 82: Fermilab physicist Jason Steffen’s frustration with slow airplane boarding drives him to figure out a formula to speed up the aisle crawl. ﻿﻿Nature’s year in review didn’t rank stories but started off by mentioning the Tevatron’s shutdown after 28 years and following up shortly with the puzzling particle news of potentially FTL neutrinos and a Higgs sighting. For science — as for politics and economics — 2011 was a year of upheaval, the effects of which will reverberate for decades. The United States lost three venerable symbols of its scientific might: the space-shuttle programme, the Tevatron particle collider and blockbuster profits from the world’s best-selling drug all came to an end. 10: Nobel Prize for the discovery that the expansion of the universe is accelerating, which laid the groundwork for the today’s search for dark energy. Fermilab has several connections to to this work. The latest tool in dark energy survey experiments, the Dark Energy Camera, was constructed at Fermilab in 2011. One of the three prize winners, Saul Perlmutter, is a member of the group that will use the camera, the Dark Energy Survey collaboration. Adam Riess, another of the winners, is a member of the SDSS-II experiment, a predecessor to DES that Fermilab was key in building and later operating its computing system. 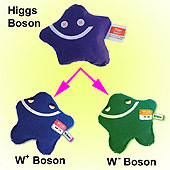 If the Higgs boson’s mass is high, it is expected to decay predominantly into two W bosons. Plushies images from the Particle Zoo. To make the ﻿﻿Ars Technica list stories had to be awe inspiring in 2011 AND have a chance of making the 2012 list as well. Science magazine chose the best scientific breakthrough of the year. Kepler’s exoplanet hunt made it into the runner up list. Tell us who you agree with or, better, yet give us your own top 10 science stories of the year. Fermilab distributed this press release Aug. 25. 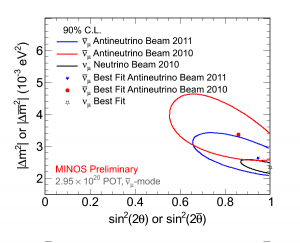 This graph demonstrates that the new MINOS antineutrino result (blue) is more precise than last year’s result (red), as reflected by the smaller oval, and the new result is in better agreement with the mass range of the 2010 neutrino result (black), reflected by the overlap of the blue and red ovals. The ovals represent the 90 percent statistical confidence levels for each result. A 90 percent confidence level means that if scientists were to repeat the measurement many times, they would expect to obtain a result that lies within the contour 90 percent of the time. The points inside the ovals show the best, or most likely, value for each of the three measurements. 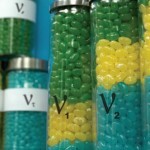 The best value for the 2011 measurement of the squared mass difference for the antineutrinos is 2.62 x 10-3 eV2. The physics community got a jolt last year when results showed for the first time that neutrinos and their antimatter counterparts, antineutrinos, might be the odd man out in the particle world and have different masses. This idea was something that went against most commonly accepted theories of how the subatomic world works. 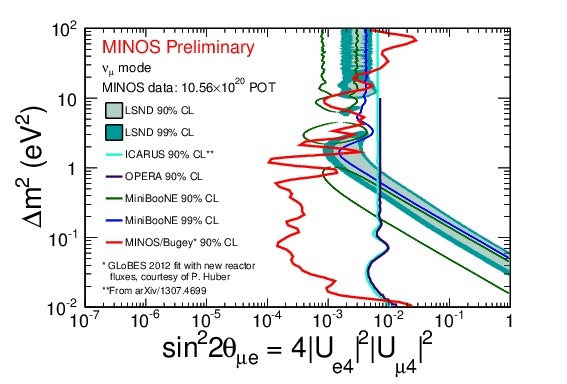 A result released today (August 25) from the MINOS experiment at the Department of Energy’s Fermi National Accelerator Laboratory appears to quell concerns raised by a MINOS result in June 2010 and brings neutrino and antineutrino masses more closely in sync. By bringing measurements of neutrinos and antineutrinos closer together, this new MINOS result allows physicists to lessen the potential ramifications of this specific neutrino imbalance. These ramifications include: a new way neutrinos interact with other particles, unseen interactions between neutrinos and matter in the earth and the need to rethink everything known about how the universe works at the tiniest levels. University College London Physics Professor and MINOS co-spokesperson Jenny Thomas presented this new result – the world’s best measurement of muon neutrino and antineutrino mass comparisons — at the International Symposium on Lepton Photon Interactions at High Energies in Mumbai, India. 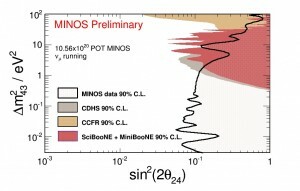 MINOS nearly doubled its data set since its June 2010 result from 100 antineutrino events to 197 events. 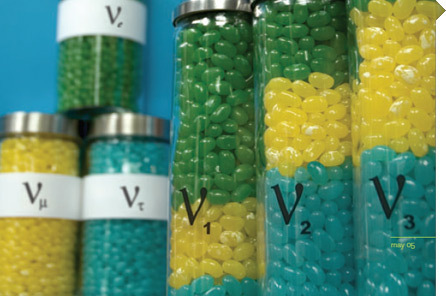 While the new results are only about one standard deviation away from the previous results, the combination rules out concerns that the previous results could have been caused by detector or calculation errors. Instead, the combined results point to a statistical fluctuation that has lessened as more data is taken. Physicists measured the differences between the squared masses between two types of neutrinos and compared them to the squared masses between two types of antineutrinos, a quantity called delta m squared. The 2010 result found, as a whole, that the range of mass difference in the neutrinos was about 40 percent less for antineutrinos, while the new result found a 16 percent difference. Because several neutrino experiments operating and planned across the globe rely on neutrino and antineutrino measurements being the same as part of their calculations, the new MINOS result hopefully removes a potential hurdle for them. Fermilab’s accelerator complex is capable of producing intense beams of either muon antineutrinos or muon neutrinos to send to the two MINOS detectors, one at Fermilab and one in Minnesota. This capability allows the experimenters to measure the mass difference parameters. 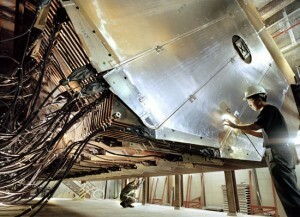 The measurement also relies on the unique characteristics of the MINOS far detector, particularly its magnetic field, which allows the detector to separate the positively and negatively charged muons resulting from interactions of antineutrinos and neutrinos, respectively. The antineutrinos’ extremely rare interactions with matter allow most of them to pass through the Earth unperturbed. A small number, however, interact in the MINOS detector, located 735 km away from Fermilab in Soudan, Minnesota. During their journey, which lasts 2.5 milliseconds, the particles oscillate in a process governed by a difference between their mass states. Further analysis will be needed by the upcoming Fermilab neutrino experiments NOvA and MINOS+ to close the mass difference even more. Both experiments will use an upgraded accelerator beam generated at Fermilab that will emit more than double the number of neutrinos. This upgraded beam is expected to start operating in 2013. The 1,000-ton MINOS near detector sits 350 feet underground at Fermilab. The detector consists of 282 octagonal-shaped detector planes, each weighing more than a pickup truck. Scientists use the near detector to verify the intensity and purity of the muon neutrino beam leaving the Fermilab site. Photo: Peter Ginter. Council in the U.K; the University of Minnesota in the U.S.; the University of Athens in Greece; and Brazil’s Foundation for Research Support of the State of São Paulo (FAPESP) and National Council of Scientific and Technological Development (CNPq). Fermilab is a national laboratory supported by the Office of Science of the U.S. Department of Energy, operated under contract by Fermi Research Alliance, LLC. The DOE Office of Science is the single largest supporter of basic research in the physical sciences in the United States, and is working to address some of the most pressing challenges of our time. For more information, please visit http://science.energy.gov. This article first appeared in symmetry breaking June 24. 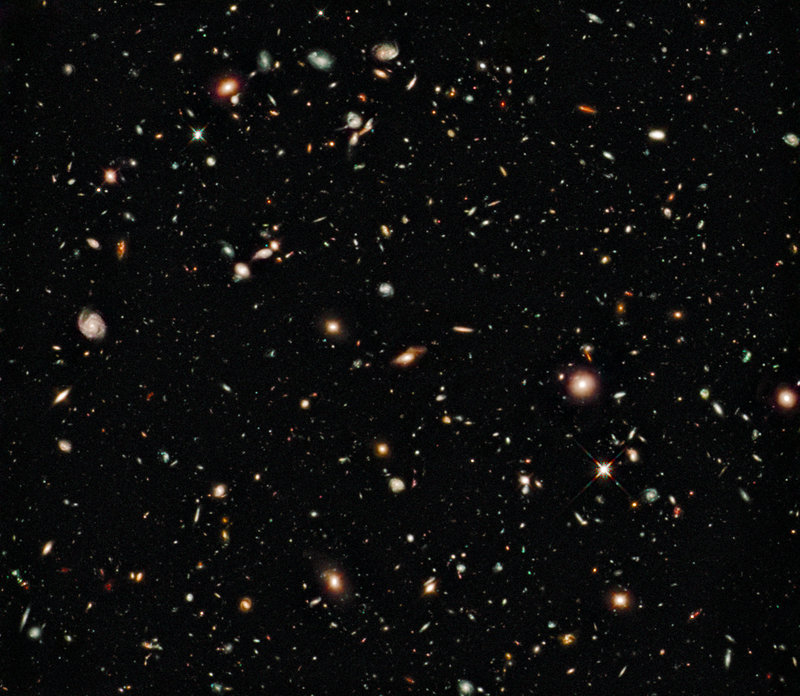 Step by step, physicists are moving closer to understanding the evolution of our universe. Neutrinos — among the most abundant particles in the universe – could have played a critical role in the unfolding of the universe right after the big bang. They are strong candidates for explaining why the big bang produced more matter than antimatter, leading to the universe as it exists today. Scientists of the MINOS experiment at the Department of Energy’s Fermi National Accelerator Laboratory announced today the results from a search for a rare phenomenon, the transformation of muon neutrinos into electron neutrinos. If this type of neutrino transformation did not exist, neutrinos would not break the matter-antimatter symmetry, and a lot of scientists would be scratching their heads and wonder what else could have caused the dominance of matter of antimatter in our universe. The MINOS result is consistent with and significantly constrains a measurement reported 10 days ago by the Japanese T2K experiment, which announced an indication of this type of transformation. The Main Injector Neutrino Oscillation Search (MINOS) at Fermilab recorded a total of 62 electron neutrino-like events. If muon neutrinos do not transform into electron neutrinos, then MINOS should have seen only 49 events. The experiment should have seen 71 events if neutrinos transform as often as suggested by recent results from the Tokai-to-Kamioka (T2K) experiment in Japan. The two experiments use different methods and analysis techniques to look for this rare transformation. To measure the transformation of muon neutrinos into other neutrinos, the MINOS experiment sends a muon neutrino beam 450 miles (735 kilometers) through the earth from the Main Injector accelerator at Fermilab to a 5,400-ton neutrino detector, located half a mile underground in the Soudan Underground Laboratory in northern Minnesota. The experiment uses two almost identical detectors: the detector at Fermilab is used to check the purity of the muon neutrino beam, and the detector at Soudan looks for electron and muon neutrinos. The neutrinos’ trip from Fermilab to Soudan takes about one four hundredths of a second, giving the neutrinos enough time to change their identities. For more than a decade, scientists have seen evidence that the three known types of neutrinos can morph into each other. Experiments have found that muon neutrinos disappear, with some of the best measurements provided by the MINOS experiment. Scientists think that a large fraction of these muon neutrinos transform into tau neutrinos, which so far have been very hard to detect, and they suspect that a tiny fraction transform into electron neutrinos. The observation of electron neutrino-like events in the detector in Soudan allows MINOS scientists to extract information about a quantity called sin2 2 theta-13 (pronounced sine squared two theta one three). If muon neutrinos don’t transform into electron neutrinos, this quantity is zero. The range allowed by the latest MINOS measurement overlaps with but is narrower than the T2K range. MINOS constrains this quantity to a range between 0 and 0.12, improving on results it obtained with smaller data sets in 2009 and 2010. The T2K range for sin2 2 theta-13 is between 0.03 and 0.28. The MINOS measurement is the latest step in a worldwide effort to learn more about neutrinos. MINOS will continue to collect data until February 2012. The T2K experiment was interrupted in March when the severe earth quake in Japan damaged the muon neutrino source for T2K. Scientists expect to resume operations of the experiment at the end of the year. Three nuclear-reactor based neutrino experiments, which use different techniques to measure sin2 2 theta-13, are in the process of starting up. A large value of sin2 2 theta-13 is welcome news for the worldwide neutrino physics community and a boon for the NOvA neutrino experiment, under construction at Fermilab. The experiment is designed to determine the neutrino mass hierarchy. It will find out whether there are one light and two heavy neutrinos, or whether there are two light neutrinos and a heavy one. Together with several nuclear physics experiments, such as EXO and Majorana, NOvA will help scientists determine what early-universe theories are the most viable ones. The MINOS experiment involves more than 140 scientists, engineers, technical specialists and students from 30 institutions, including universities and national laboratories, in five countries: Brazil, Greece, Poland, the United Kingdom and the United States. Funding comes from: the Department of Energy Office of Science and the National Science Foundation in the U.S., the Science and Technology Facilities Council in the U.K; the University of Minnesota in the U.S.; the University of Athens in Greece; and Brazil’s Foundation for Research Support of the State of São Paulo (FAPESP) and National Council of Scientific and Technological Development (CNPq). Neutrinos could tell us why matter formed in the early universe. The Japan-based experiment T2K Tuesday gave scores of U.S. particle hunters a license to ready their detectors and take aim at the biggest question in the universe: How everything we see came to exist. “It’s our hunting license,” said Fermilab physicist and University of Rochester professor Kevin McFarland, who works on T2K and neutrino experiments at Fermilab. The observation by T2K affects what the Fermilab neutrino experiments NOvA and the proposed Long Baseline Neutrino Experiment, LBNE, can expect to discover and how quickly. It also makes the experiment McFarland serves as co-spokesman on, MINERvA, more important than ever in the international neutrino-research field. Physicists working with T2K recorded six muon neutrinos changing into electron neutrinos across a long distance, a transformation called theta 13 in physics circles. Physicists had predicted that they should observe only 1.5 of these transformations as background events rather than the six they did observe, so the probability of the existence of an electron neutrino appearance is estimated to be 99.3 percent. While the T2K observation doesn’t rise to the level of “discovery” in the science community, it is far enough beyond the expected statistical error bar to make people shout for joy and start revising plans for their own particle hunts. The T2K observation also was statistically large enough that it quells a long-standing fear that this transformation would be statistically too small, much less than one percent, to observe. At that level, modern technology wouldn’t be able to use the observation as a stepping stone to move to the next research phase in figure out how matter came to dominate antimatter in the universe. Physics predicts that the three types of neutrino particles can change back and forth into one another across long distances. Previous solar and reactor neutrino experiments had observed two types doing just that, but the third switch – muon neutrino into electron neutrino – had remained elusive. T2K’s recording of this transformation, the first of its kind, means that physicists will have the tools to track down the next two potential discoveries on the path to the ultimate trophy. After the Big Bang, equal amounts of matter and antimatter should have annihilated each other leaving nothing but free-floating energy. But we’re here and antimatter isn’t, so that didn’t happen. 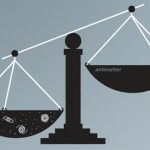 Something tipped the scales in matter’s favor, allowing particles to join together and form planets, plants and people. Physicists think neutrinos could be that tipping-point particle. The first step in finding out if they are right is T2K’s observation. Plugging this observation into the research equation, physicists on NOvA, an experiment under construction in Minnesota, will be able to tease out the details of what is called the neutrino mass hierarchy. The pattern of this hierarchy essentially will tell physicist if neutrinos behave like other particles, in a pattern of light, heavy and very heavy, or neutrinos behave oddly in a pattern of light, heavy and heavy. 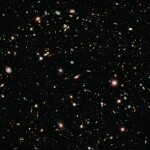 This pattern of masses is important to know because it provides a clue to help physicists understand what causes neutrinos to have masses that are so much lighter than other particles and why neutrinos aren’t massless as predicted by the Standard Model, the playbook for how the world works at the subatomic level. NOvA is ideally situated to do discern this pattern because its particle beam will travel three times as farther than T2K’s, allowing researchers see how the material in the Earth alters the change from muon to electron neutrinos. T2K’s observation of half a dozen muon neutrino to electron neutrino changes points to the relatively high rate of the change, so NOvA should have a lot of data to work with to speed up the discovery of the mass hierarchy. Step three is combining what NOvA learns about the mass hierarchy with more precise data from the LBNE experiment to look for differences in the neutrino and antineutrino probabilities of changing from muon to electron neutrino types. After accounting for the effect of the earth and the mass hierarchy, any remaining difference would point to a fundamental difference between matter and antimatter neutrinos. 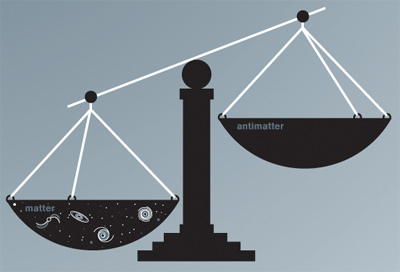 Differences between matter and anti-matter are nearly non-existent in nature and these differences are precious clues about why matter dominated antimatter to survive in today’s universe. LBNE, proposed for South Dakota, sits even farther away from the Fermilab neutrino source, making it well-suited to make this comparison of antineutrinos, which are rarer and harder to detect than neutrinos. T2K’s observation of a large change signal means LBNE will have better statistics to create precise comparisons. The level of precision could mean the difference between getting an answer or not, depending on how subtle the difference is between neutrinos and antineutrinos. Short-baseline experiments can’t compete in the hunt for why matter dominated antimatter, which requires tracking neutrinos across great distances, but they can provide the precision measurements that work like a rifle scope for the particle hunters. MINERvA at Fermilab and the neutrino reactor experiments Daya Bay in China and Double Chooz in France will provide the data to allow NOvA and LBNE to zoom in on the minute details of mass hierarchy and how neutrinos change types. 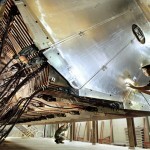 The reactor-based experiments with detectors near to neutrino spewing reactors were designed to be experts at finding the neutrino change T2K found. Ideally, they will find a cleaner neutrino transformation signal, without the data complications, such as the effects of Earth material on the transformation that come with T2K and NOvA being multi-purpose experiments. Cleaner reactor experiment measurements provide a baseline for the measurements of NOvA and LBNE. MINERvA will provide data to help NOvA and LBNE map the type and amount of background events that can obscure their search. This will enable physicists to put the trophy deer-like potential discovery in their analysis cross-hairs and discount the imposter trees and hunters dressed in brown that cloud the view of their data. 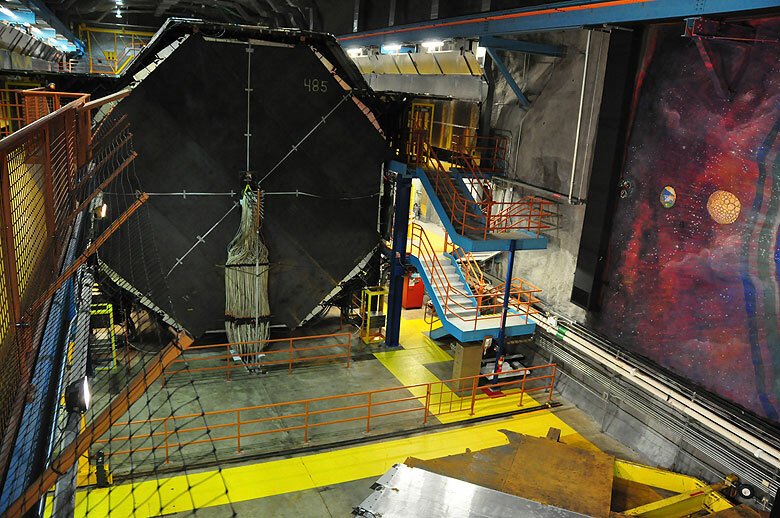 While MINERvA was built for this job and currently aids neutrino experiments across the globe, including T2K, with this variable-removing research information, T2K’s observation makes MINERvA’s unique skill more important. The large T2K signal means a lot of data and the ability to do precision analysis if MINERvA can tell researchers what variables to discount. “There is always an exchange of data, and one experiment builds on another,” McFarland says. Previously data from the MINOS experiment at Fermilab told T2K how to tune the energy of its particle beam. Now T2K is returning the favor with an observation that will help Fermilab experiments. The cleanup of the MINOS cavern and the rest of the Soudan Underground Laboratory is complete. Two months after a fire broke out in the access shaft of the Soudan mine, the Soudan Underground Laboratory is again open for operation. Safety officers inspected the mine and laboratory last week and issued a permit for normal occupancy. The officers identified a short list of additional repairs, which will be carried out in the upcoming months. Work also continues on the Soudan mine shaft. 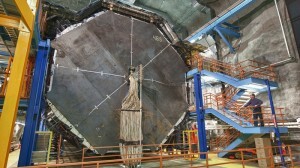 The 5,000-ton MINOS far detector is located a half mile underground in the Soudan laboratory. In March, fire-fighting foam covered parts of the detector and the lowest part of the magnet coil was partially immersed in water. Laboratory staff gently heated the coil over the past two weeks to dry it out. The CDMS experiment, located in a cavern adjacent to the MINOS detector, experienced no damage to its equipment except to a backup generator. Its cryogenic system recovered unscathed from the power outage triggered by the fire. CDMS scientists have removed the new particle detectors they were testing before the fire, and they will begin operation of an expanded experiment with more dark-matter detectors in September. University of Minnesota building code inspectors and ES&H personnel from the university and Fermilab inspected the laboratory last Wednesday. The University of Minnesota manages the Soudan Underground Laboratory.